"This is a great warm weather cocktail with or without the splash of bitters." Fill a cocktail shaker with ice. Pour in the gin, lemon juice, simple syrup and a dash of bitters. Cover and shake until the outside of the container is frosty, about 15 seconds. Strain into a highball glass full of ice. 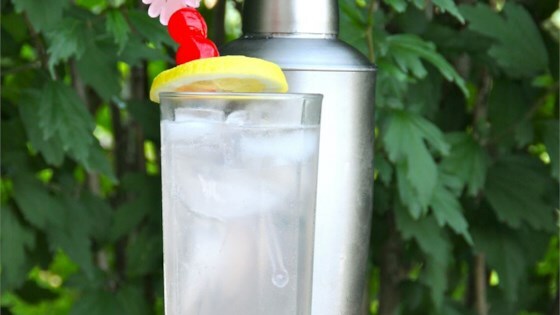 Top off with club soda and garnish with a lemon slice and maraschino cherry. See how to mix up a refreshing classic cocktail. This is one of my favourite bar drinks. Not too sweet, but not too sour either. Highly recommended. Great recipe, thanks! I added a little more simple syrup- perfection. Live this summer time cooler... Yum! I hate drinks that are too sweet but added just a bit more simple syrup to cut the tartness. This is light and refreshing. Perfect compliment to Gin's botanicals.